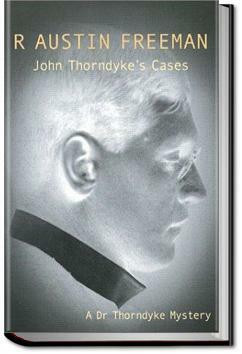 At the turn of the 20th century, Richard Austin Freeman emerged as an author to be reckoned with in the world of detective fiction, introducing the highly memorable scientific detective Dr. Thorndyke, an early forensic sleuth. Armed with his little green case full of scientific detection aids, Thorndyke unravelled murders and mysteries using logic and material evidence. . . .ll be seen that the appearances are not such as would be expected. The deceased was five feet nine inches high, but was very thin and light, weighing only nine stone six pounds, as I ascertained by weighing the body, whereas I am five feet eleven and weigh nearly thirteen stone. But yet the footprint of the deceased is nearly twice as deep as mine—that is to say, the lighter man has sunk into the sand nearly twice as deeply as the heavier man." The magistrates were now deeply attentive. They were no longer simply listening to the despised utterances of a mere scientific expert. The cast lay before them with the two footprints side by side; the evidence appealed to their own senses and was proportionately convincing. "This is very singular," said the chairman; "but perhaps you can explain the discrepancy?" Good set of forensic mystery stories. I also liked the fact that this was illustrated, which allowed the reader to see some of the samples Thorndyke used in proving his cases! These stories include a lot of the details that went into a coroner's trial, and tend more towards a police procedural. All of the stories seemed predictable . i did enjoy reading them .i would give it a 3. 1/2 star rating. I thought. Each story was quite predictable . I enjoyed reading them. I will give them a 3 star rating. This series of stories featuring Dr. Thorndyke is a mixture of tales that are somewhat uneven in quality. I generally like them, and the good doctor is definitely a genius at what he does. This is a delightfully intriguing collection of short mystery fiction. The tales are puzzle style mysteries with a medical theme and are somewhat reminiscent of Sherlock Holmes or Hercule Poirot. The mysteries are set in England in the early 1900s.